#6 – We waste our cancer if we think that “beating” cancer means staying alive rather than cherishing Christ. I don’t know about you, but I have done a fair amount of research about my cancer, multiple myeloma. The Internet has been my friend, with doctors from multiple institutions. I can tell you about statistical odds and technical terms. I have to catch myself, though, in the midst of my research. Certainly I want the best treatment. Certainly I want to understand. Certainly I want to be a part of decision making. But there is time when statistics, diagnoses, and treatments become moot points. The cancer takes over. My cancer is considered “incurable.” We knock it down, but it always comes back. There is no “cure.” So that means, after a point, research goes into dark areas. Obituaries start to appear on the Internet. My thoughts start to wander into the valley of hopelessness. Do I want to beat cancer? You beat. John Piper has gone past the 5-year mark and is considered cured. I’m happy for him. Maybe I will live long enough for them to find a cure, but for now, I face reality. Where we go wrong is thinking that a cure is good because disease is bad; that life is good because death is bad. For a Christian, death is just an extension of the eternal life we received when we believed in Jesus for our salvation (John 17:3). Knowing Christ in each stage of my life changed my life. I know the peace I have experienced, the courage, the longings that are not natural to me. As wonderful as it has been, what would make me think it would end in death based on his promises? Some people think I am a fool to believe in an eternal home with God. But when I look at what they believe in, that dying is the end of being, I feel sorry for them. My faith gives me hope and courage. I wonder about theirs. #5 – We waste our cancer if we refuse to think about death. Many people become uncomfortable when I talk about death. I shocked a hairdresser yesterday leaving the shop, saying I didn’t know when I would be back. It’s not something the healthy want to think about. Somehow we try to fool ourselves to feel we are immortal; that if we just eat right and drive safely, we’ll have a future and a sense of security. But what we don’t account for is the minute germ clinging to our hand or the drunk driver spinning across the road. If we knew death was coming, we would think differently. We would tell our children we love them. We’d hold them a little more closely. We would not waste time and prepare financially. We would think about spiritual and eternal destinations. Instead, we like our little world of denial. Even cancer has a hard time breaking in. I remember talking with friend with terminal breast cancer about the meaning of “courage.” Everyone says we are courageous, but what does that mean? We are fighting, but there is also courage expressed in those last moments when we surrender. Somehow we think we can control what is within us. But the truth is, we can’t control it. Death will come for all of us. I can’t control cancer anymore than a car flying at me. My mind and spirit cannot control the cancer eating away at my bones. The issue is not death; the issue is life. What will I do with my days? Psalms 90:12 says, “Teach us to number our days that we may get a heart of wisdom.” Cancer helps us to realize the number of days before us is shorter than what we thought when we were in a state of denial. Cancer helps us develop wisdom. And I love how the psalm talks about a “heart” of wisdom, because so much of what we learn is emotional. In my acceptance of death, I grew in sensitivity to love — awareness of my own love for others as well as lost opportunities for love. I celebrated as well as grieved. I forgave as well as received forgiveness. Sometimes, I realized that emotional healing was not going to happen, that it takes two people who are willing. Even in that grief, I knew I had taken the steps I needed in the numbered days that I had to pursue reconciliation. Now I could turn to loving others. Pray that I would develop a “heart of wisdom” instead of denial of death. That is my prayer for you, no matter how many days you have. #3 – We waste our cancer if we believe it is a curse and not a gift. I have seen so many people suffer unnecessarily. It’s not their disease that is causing the suffering, but their judgment of themselves. They are looking for a cause within themselves that will explain why they were chosen — did they eat the wrong foods? Where they exposed to the wrong environment? Did they make wrong choices? Was it inherited? It’s as if we have to have something to blame, including ourselves. If we can find the cause, then we think it will make sense to us. What we don’t realize is the damage we do to ourselves in the process. I think of Psalms 3:6 where David talks about the thousands who are accusing him — to me it’s the thousands of voices in my own head that accuse me. And so what? What if we smoked or the office had asbestos? What difference does it make if our uncle had cancer? It doesn’t take away ours. We can’t un-write what has already been written. Cancer, death, being mortal, is a curse from the beginning of time. It was not God’s ideal. It ended up being what separated us from God. But it is also what brings us to God. Going through the suffering, we need hope. It’s not just the hope for a cure, but also a hope for a future. It brings us in touch with our mortality, the inevitable. It challenges us to think differently about this life on earth and what is to come. Our soul is our connection with God and separates us from the plants and animals. That awareness, and even the fear that comes with it, is a gift. When you look death in the face, you also see life. Each day is precious. It’s savored. Before cancer, I was not as aware that each day contains opportunities to write memories and leave legacies. It’s not about us as much as it is about those who remain. But I could not flee. It was all over me! Receiving it as a gift, without having to know all the whys, gives a sense of release. God does forgive the past and, in his grace, he offers a future. #2 – We waste our cancer if we do not believe it is designed for us by God. I struggle with this second point from his book. I do believe God allowed cancer in my life. Somehow, in the mass of humanity, I was chosen against the odds for Multiple Myeloma (African-American men get it the most, then Caucasian men, African-American women and lastly Caucasian women). It is hard for me to think of the God I love handing me cancer. I can’t imagine giving such a horrible gift to one of my children. But if I take a step back and try in my feeble mind to look at it from the eyes of a loving God, maybe I can begin to gasp it. We all die. It is the result of sin, a fallen world. But how does a loving God determine the way we die. Some go quickly while others suffer. Some have medical intervention while others have none. Some people live with daily diseases, trying to regulate their lives for just a few extra days. How does he decide how we die? Are the kinds of death like playing cards he randomly deals out? That doesn’t fit my view of God. I think he must know who can handle what and the impact it will have on those around them. I think, in his love, he does suddenly call some home. And I think in his love, he does ask some to suffer. Can suffering and love coexist? I know in my case, my suffering causes me to turn to God. My suffering is physical and emotional, but it is also spiritual. It’s not enough to hope that my doctor is wise or that the medicine will work. To get through suffering, I need more. “What God permits, he permits for a reason,” John Piper says. As I chew on that statement, I have to agree. He permitted cancer into my life. There is a reason I was chosen versus someone else. I may never know the reason, but cancer does make me more dependent on Him. And I know it has an effect on the lives of others who are seeing me go through it. God is doing something in their lives also. I often say, “God didn’t just bring cancer into my life. He brought it into my husband’s life, my children’s lives, the lives of my grandchildren and friends.” Accepting it personally is, in part, to help others accept it and to allow God to work through in their lives. In the same way God and cancer makes me dependent on God, I want to encourage them. So I guess, reluctantly, I have to agree: God designed this cancer for me. He didn’t just allow it. It’s a precious gift in a horribly wrapped package. As I tear the paper, I can’t wait to get rid of it. The future is what is inside. What is your perspective? Do you think God chooses us personally? I’m interested in what you think so please comment. 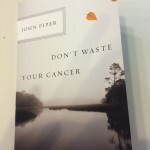 I was recently given a little booklet entitled “Don’t Waste Your Cancer” by John Piper. Although my style and perspective is different, it gave me some good thoughts to chew on so I thought I would look at each one with you and we can chew together. #1 – We waste our cancer if we don’t hear in our own groaning the hope-filled labor pains of a fallen world. Anyone who knows me knows that I have embraced my cancer. It is a part of my life. I talk about it almost as much as I talk about my children. It is part of life…my life. I talk about it because death is coming, for me as well as all of us. It was not the original plan of creation. God created man “in our image,” the image of an eternal God. But sin, rebellion from dependency on God, changed our character forever. We long for oneness with God and do our best to find it in nature and relationships here on earth. We suffer the pains of a fallen world. And those who know me know I am not afraid of death. I do believe something wonderful is coming. I know some people have written detailed versions of heaven, and some even claim to have been there. I think I would rather be surprised. What I do know is that God is there without the “falleness” we have known here on earth. I can’t wait to see what that looks like! And when I talk to others who are not followers of Jesus, they talk of death as sleep or nothingness. Nothing isn’t bad if you are not even aware of it. But it’s a little hard to find “hope” in it. I think I’ll stick to my faith. 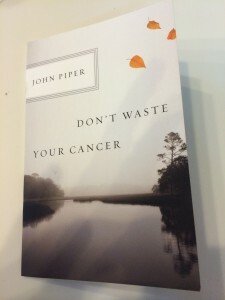 I think Dr. Piper is making the point that we waste our cancer if we don’t look it in the face and call it what it is. It’s part of this fallen world. It’s part of life as much as death and suffering are a part of life. We try to avoid, but it’s always there in the end. And if we don’t grasp it and take it to ourself, what God wants to do in our life is wasted. What are your thoughts? Do you know someone with cancer? Comment and I’ll pray for them. You might want to send them a link to this site if you think it would be helpful.